With over 55% of the US market share, YouTube is the largest online video platform in the country. It is also the 2nd largest search engine in the world. It offers marketers a very relevant demographic – adults aged 18-49 years of age who consist of 67% of the total audience on YouTube, as compared to just 24% of the total audience on primetime TV. 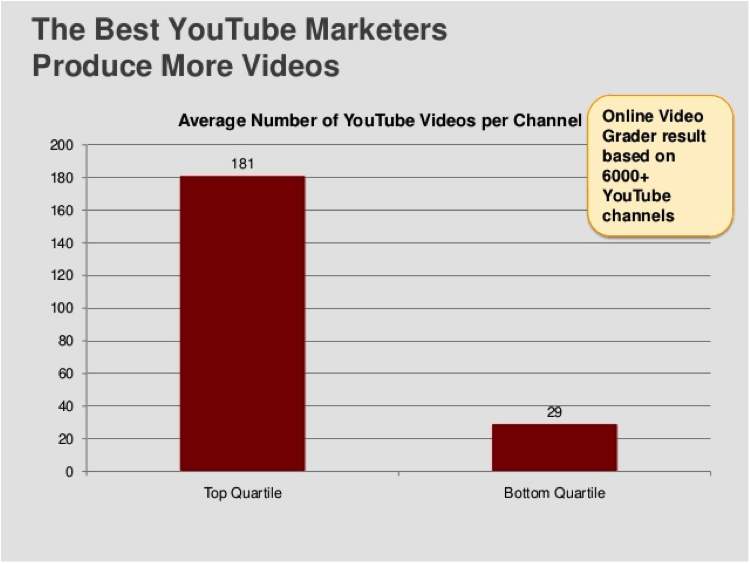 Which marketer can possibly resist staying off of YouTube after a sampling of those numbers? Very few, is my bet. In fact, a study of the Interbrand Top 100 brands, showed that the average number of content marketing videos produced by these brands jumped from 4760 per month in 2011 to 7175 per month in 2012. Clearly, the biggies really put their money where the numbers are. But why let just the top 100 brands enjoy the perks of this explosive, engaging and effective platform? It’s high time you take the dive into YouTube marketing. Here’s a quick guide to help you along the way. No one likes to watch ads. While this is true of TV, it’s truer of the internet. Most YouTube ad formats allow the user to skip an ad after it plays for 5 seconds. Logically, most users ensure they use this option and go ahead to watch what they came to YouTube for, in the first place. There’s huge merit in conciseness. Keep the length of your video crisp and watchable. Between 30 seconds and 60 seconds is a good thumb rule to use, when in doubt. If you choose the InStream format, then keep the length even shorter. According to Steven Young from SmartShoot, the drop-off rate beyond the 60 second mark stands at 80%. Moral of the story: short and sweet = watchable. With decent quality video recordings now possible from even a cell phone, nearly everyone thinks they have video marketing down pat. The trouble is, with the proliferation of amateur, low quality videos on the web, the number of views that each of these receive is abysmal. Mind you, if your content is exceptional, you probably will still get eyeballs and click-throughs to your site, but with the competition out there rolling out slick video ads, you do not want your brand to be at the losing end of the bargain. If creating video content is something that you are actually serious about, invest in a good quality camera. It does not need to be a very high end one, but just one with the basic functions and a good resolution. Have a script ready, create a storyboard, rehearse the storyboard, and then shoot. Don’t just post the video you just shot. Edit out the unnecessary fluff, polish the video with the tons of free (and paid) video editors out there and THEN post it. Consistency in format, tone, and message are key ingredients for any quality video content marketing effort. This makes your videos easier to identify with your brand, it makes it easier for you to create new video content based on an established brand voice and most importantly, it tells a viewer what to expect when they click on your video. Rinse and repeat this process multiple times, as research shows that the most successful brands on YouTube are ones that have a large number of videos featuring them. Another thing to keep in mind while producing your video content is to create a variety of different videos talking about your brand from different points of view. This ensures that you reach out to different types of audiences and prevents your videos from looking jaded and all the same. Invest in a project management tool like WorkZone or Zoho to assign clear responsibilities for each task listed here to individual team members. Create schedules for when you want your videos to go live, know who is responsible for them and how far along the project has come, and, finally, collate all the video content that you produce over the years in a single unified location with such a tool. However awesome your video is, unless the right audience is viewing it you can’t expect any conversions at all. Imagine displaying your English language video about a cupcake store in New Jersey being displayed to Chinese viewers watching a Kung Fu video in Shanghai. What a complete waste of marketing dollars! YouTube is not a Google subsidiary for nothing. It follows a similar search logic as Google’s Search does. The more search friendly your videos are, the higher are your chances of showing up to a relevant audience and being viewed by them. Now you might wonder how you can make an audio visual format keyword friendly. Well, you still have the basics that you use in a regular webpage that you can use. Use relevant keywords in the Title Tags and Descriptions of your videos. Don’t know what keywords your specific target audience is searching for? Use tools like the Google AdWords Keyword Planner or SEMRush to find out what users are searching for, what keywords your competition is betting on, even keywords related to your current lot that can be used as alternatives. If possible, include a transcript of the actual video in your description for viewers who might have a problem with video playback. Including a link to your landing page or home page in the description area is also a great idea to drive conversions. Your website is usually the place that you want your video viewers to end up in, if not your real-world stores. We have already discussed the various ways in which your website can be highlighted in your videos – via your call to action, links in your description, and verbal messaging by the characters in your videos. But how about the other way around? Does your website carry links to your video content? Does your blog promote your content marketing videos? If not, then make sure they do. Have a separate section in your website for product and content marketing videos. Each time you upload a new video to your YouTube channel, promote it by posting a link on your blog. Don’t forget social media. Include social follow and share buttons in your videos (the closing slate). Use tools like ClickToTweet, which allows users to share videos to Twitter from right inside YouTube. Promote your videos on Facebook, Twitter, LinkedIn, or any other relevant social network with a URL and a short description urging fans to take a look. Finally, the most important thing to remember is that YouTube marketing follows the same basic principles of content marketing. Create videos that are fun to watch, that highlight your product without being blatantly in-your-face and that are promoted using the basic guidelines of YouTube. If you follow these guidelines, you’ll have an audience waiting for your next video to be released.